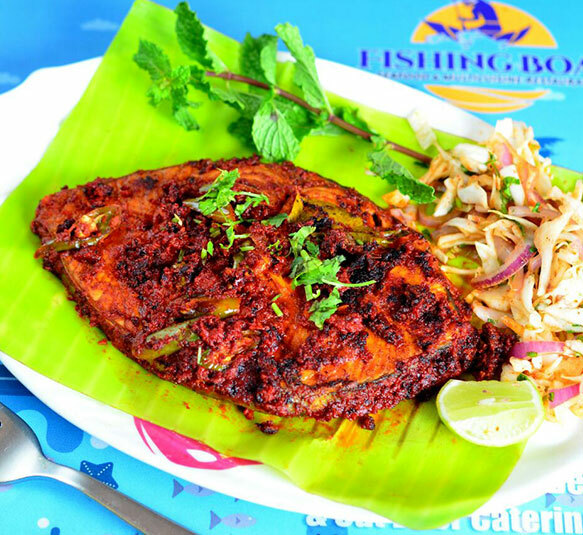 The Fishing Boat is multi cuisine fine dining restaurant with special of Mangalorean cuisines in the neighbour hood of Electronic city(1st Phase). Fishing Boat welcomes its 'Atithis' with folded hands to come and delve into the authentic flavours of Mangalorean, Indian, Tandoor and chinese dishes. Everything we server is made to please the most discriminating palates. Our chefs blend flavours masterfully with imagination and tradition composing the most appetising cuisines. We use only the finest ingredients to always ensure the superlative quality of our culinary creations and excellent food prepared by our chefs, giving our guests a truly elegant ambience and a memorable place. Why Eat in Fishing Boat? From the unknown past, banana has been a part of the Indian culture especially in the South India. Any guests will be served on a banana leaf which is considered humble and respectful. Eating on a banana leaves were a simple sprinkling of water is enough to clean a banana leaf is considered hygienic rather than on an unhygienic re-useable metallic or porcelain utensil. Banana leaves contain large amounts of polyphenols the antioxidants in banana leaf is reported to help fight cancer and many other diseases. According to an article by Augustin Scalbert and colleagues published in the January 2005 issue of the "American Journal of Clinical Nutrition," extensive research is ongoing to help determine the extent of how polyphenols affect human cells, the oxidative process and its impact on disease prevention. As there is no chemical reaction the food keeps its value intact, it can take heat and react well without tearing apart by the heat. Tasting better has it is considered green leaf, adds value to food just like any other greens and it contains the leaf taste to make it better.